Are you laughing at this photo? I am! I love everything about this photo, because it points to the things that lit me up as a child -- my secret hiding place (behind the flower bush pictured here); my Mickey t-shirt, which represented my favorite fantasy land; and my cowboy boots, which I loved to dance and perform in. It's often said that children don’t hold back, because they have not yet been colored by experiences that tell them they should change who they are. As adults and leaders, we can look back and connect with those passions and talents we had as children that may be lying dormant today. They often are a clue to those unique things about us that, if brought back to life and strengthened, can invigorate us and provide authentic sources of happiness and success. We also can do the same by learning and activating our talent themes through tools like StrengthsFinder. What you may notice, as I did, is how they are very much connected! During the time period during which the above photo was taken, I was mostly living my talent themes of Ideation and Communication. All I wanted to do was use my imagination! My adventures were never in real-time, but off in some far away land. 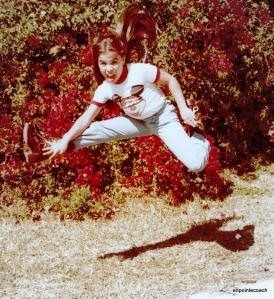 At that time, I communicated frequently, but through my favorite form of expression -- singing and dancing, hence the rockin' Van Halen-inspired jump pictured above! It's not so different today! In order for me to feel authentic and perform at my best, I have to be learning, creating, and communicating. Today, they simply play out a bit differently -- through my training sessions, blogs written, and through my other talent themes, like Maximizer, that push me to help others self-actualize. So, although we always want to tackle a great BIG goal each new year, what I’m suggesting is that we do something quite simple: See this new year through the eyes of our inner child. My sense is that, in doing this one simple thing, we’ll achieve our goals with greater ease and happiness. 1. Go Back. Find a photo of yourself as a child, one that without question speaks to who you are at your core. 2. Take Note. Grab a sheet of paper and without thinking, write down the first five words that capture the essence of your childhood spirit. Then, think of five specific memories (one for each word) that brings each word to life. You also can do this with your top five StrengthsFinder talent themes! 3. Come Into the Now. Find a photo of yourself today that you love! If you don’t have one, take one! 4. Bring Your Words to Life. Take your five words and clearly define how you can lead with them daily. 5. See It. Live It. Place the two photos on large poster board or create a screensaver of the two images, your five words or talent themes, and your new actions. Look at it daily. This is a new twist to the standard vision board; less time consuming and more powerful. Bring in some authentic energy this new year. Give my prescription a try, and enjoy re-connecting with your inner child and leading with your strengths. 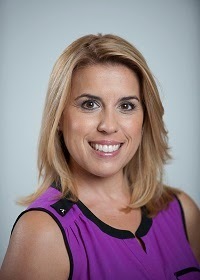 Monique Reneé Catoggio is Director of Life Well LED (LWL) Programs and Coaching at Florida International University, in Miami, Florida. LWL is where leadership and well-being come together to offer a unique approach to personal leadership. Monique teaches and coaches participants learn to live and lead from the inside out and develop an effective leadership style that is balanced, conscious, creative, inspired, and productive. LinkedIn and Twitter handles are below. Facebook is coming soon!